“THESE are fields of hope,” says Gu Zhen’an, gesturing at a barren scene. A burly chain-smoker, he spent 25 years overseeing road-building crews in central China. But three years ago, when he finished paving a highway to a new high-speed railway station in this quiet corner of Anhui province, he decided it was time to switch industries. The land still looks empty, served by first-rate infrastructure but home to few people and fewer businesses. Mr Gu, however, sees things differently: he expects a city to sprout up around the train station. In anticipation, he has built an old-age home, with plans to expand it into a complex for 5,000 people. To appreciate the extent of China’s high-speed rail ambitions, take Mr Gu’s dreams and multiply them many times over. Less than a decade ago China had yet to connect any of its cities by bullet train. Today, it has 20,000km (12,500 miles) of high-speed rail lines, more than the rest of the world combined. It is planning to lay another 15,000km by 2025 (see map). Just as astonishing is urban growth alongside the tracks. At regular intervals—almost wherever there are stations, even if seemingly in the middle of nowhere—thickets of newly built offices and residential blocks rise from the ground. China’s planners hope these will be like the railway towns that sprouted (at a slower pace) in America and Britain in the 19th century. In their rush to build, waste is inevitable. The question is whether gains will outweigh losses. Five years after the busiest bullet trains started running (the Beijing-Shanghai line opened in 2011), a tentative verdict is possible. In the densest parts of China, high-speed rail has been a boon: it is helping to create a deeply connected economy. But further inland, risks are mounting of excessive investment. In China’s three big population centres—the areas around Beijing in the north, Shanghai in the east and Guangzhou, the capital of Guangdong province, in the south—life and work have started to follow the sinews of the high-speed rail system. Trains were previously too infrequent, too slow and too crowded to allow for daily commutes. Now, each of these three mega-cities is developing commuter corridors. Little wonder: house prices in satellite towns and cities tend to be much cheaper. In Kunshan, for example, homes cost about 70% less than in nearby Shanghai. But the bullet train between the two cities takes just 19 minutes and costs a mere 25 yuan ($3.60). And Kunshan is just one of many options for those seeking to escape Shanghai’s high costs. There are now about 75m people living within an hour of the city by high-speed rail. Surveys show that more than half of passengers on the busiest lines are “generated traffic”—that is, people making trips that they would not have made before. This is unquestionably good for the economy. It means the trains are expanding the pool of labour and consumers around China’s most productive cities, while pushing investment and technology to poorer ones. Xu Xiangshang, a dapper businessman, oversees sales of apartments built next to high-speed railway stations in less well-off parts of Anhui. These are less than half an hour from Nanjing, a prosperous city of 8m that is the capital of Jiangsu province. “Bullet trains are becoming just like buses,” he says. The economic benefits are hard to measure precisely. Traditional analyses focus on the financial performance of high-speed rail lines, plus indirect results such as reduced road congestion (see article). But bullet trains are more than just a mode of transport. China wants to build a “high-speed rail economy”. It is a twist on the theory of urban agglomeration—the idea that the bigger the city, the wealthier and more productive its people tend to be. The idea is to cap the size of mega-cities, but achieve the agglomeration effect with the help of bullet trains. China reckons that the resulting network of large, but not oversize, cities will be easier to manage. The World Bank, for one, is optimistic. In a report published in 2014 it said the benefits of high-speed rail would be “very substantial”, potentially boosting the productivity of businesses in China’s coastal regions by 10%. But might regular, reliable, fast-enough trains around big cities have been almost as good as high-speed rail, at a fraction of the price? The OECD, a rich-country think-tank, reckons it costs 90% more to build lines for trains that reach 350kph than it does to lay ones that allow speeds of 250kph. For longer lines with more than 100m passengers a year and travel times of five hours or less—such as the one between Beijing and Shanghai—the more expensive type may be justifiable. It is less so for journeys between commuter towns, during which trains only briefly accelerate to top speeds. For longer journeys serving sparse populations—a description that fits many of the lines in western and northern China—high-speed rail is prohibitively expensive. The overall bill is already high. China Railway Corporation, the state-owned operator of the train system, has debts of more than 4trn yuan, equal to about 6% of GDP. Strains were evident last year when China Railway Materials, an equipment-maker, was forced to restructure part of its debts. Six lines have started to make operating profits (ie, not counting construction costs), with the Beijing-Shanghai link the world’s most profitable bullet train, pulling in 6.6bn yuan last year. But in less populated areas, they are making big losses. A state-run magazine said the line between Guangzhou and the province of Guizhou owes 3bn yuan per year in interest payments—three times more than it makes from ticket sales. Many had thought China would rein in its ambitions after the fall of Liu Zhijun, a railway minister who was once revered as the father of the bullet-train system. In 2011 he was removed for corruption. Shortly after, a high-speed rail crash caused by a signalling failure killed 40 people. The mighty railway ministry was disbanded and folded into the transport ministry. China slowed its fastest trains down from a world-beating 350kph to a safer 300kph. The bullet trains have run with few glitches since the tragic crash. But the network expansion now under way is even bolder than Mr Liu had envisaged. 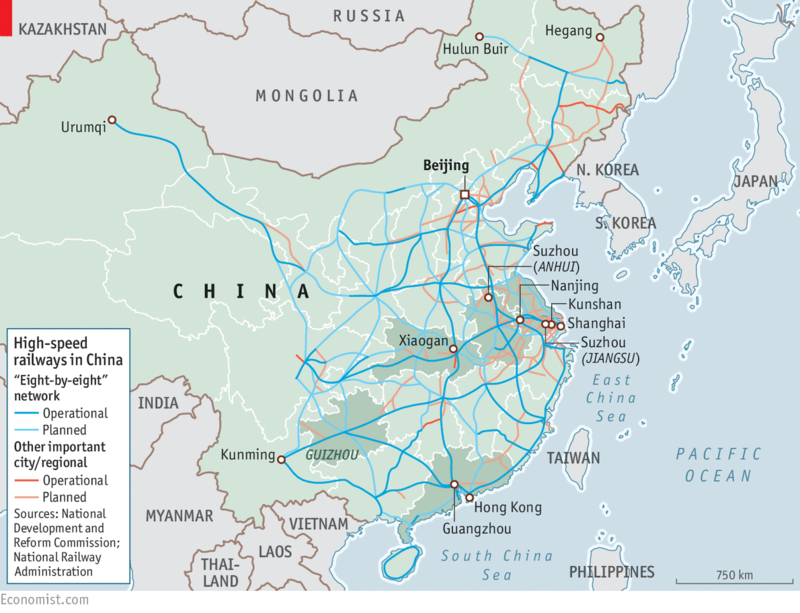 China has a four-by-four grid at present: four big north-south and east-west lines. Its new plan is to construct an eight-by-eight grid by 2035. The ultimate goal is to have 45,000km of high-speed track. Zhao Jian of Beijing Jiaotong University, who has long criticised the high-speed push, reckons that only 5,000km of this will be in areas with enough people to justify the cost. “With each new line, the losses will get bigger,” he says. Making matters worse, China has often placed railway stations far from city centres. Bigger cities should eventually grow around their stations, but suburban locations will not produce the same economic dividends as central locations. In smaller cities, prospects are even bleaker. In Xiaogan in Hubei province, the station was built 100km from the city. The decision to base stations so far away reflects the realities of high-speed rail: for trains to run fast, tracks need to be straight. But that limits potential gains from lines as they traverse China. 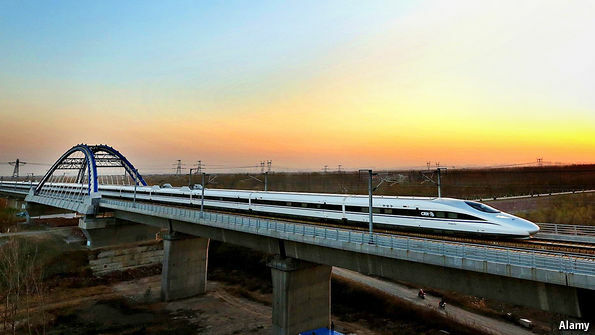 Wang Lan of Tongji University in Shanghai says the government should turn isolated stations into transportation hubs by adding new rail connections to other nearby places. That, though, would be another big expense. Dangers are all too visible in the city of Suzhou in Anhui province (not to be confused with the successful example of Suzhou in Jiangsu). Its station is 45km from the city centre in the barren landscape where Mr Gu lives in hope. The government thought it would spark development. It paved eight-lane roads to serve a vast industrial park on one side of the station. Investors built clothing, food and pharmaceutical factories. But all are closed, except for a paper mill. Undeterred, the government is building a commercial district on the other side of the station. Nearby, Mr Gu’s old-age home is off to a good start, with help from a local hospital. Down the road there is a drab collection of stores, restaurants and houses. This was meant to be the kernel of the new railway town: people were resettled here to make way for the tracks. Two older residents say they are sure that better days are just around the corner. They have heard that the government will move in 100,000 people from a part of western China plagued by landslides. Suzhou will provide the new arrivals with a place to live and they, in turn, will provide the town with the population it needs to thrive. But it is impossible to confirm the rumour—one more article of hope in what China likes to call its “high-speed rail dream”.